Getting a professional air conditioner installation is key to getting the most out of your new air conditioning unit in Davidson. When summer is in full swing, you definitely want an air conditioner if you live in Davidson, North Carolina. 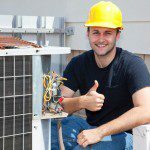 If your air conditioning unit goes out or you need to get a replacement, you can call us at Cool Comfort Heating & Air for a complete air conditioner installation. Another reason you might consider a new air conditioner installation is if you are updating your unit. New AC units are more energy efficient and can give better results at a lower cost. If your energy bills seem to be skyrocketing lately, it might be worth it to you to replace yoAir Conditioner Installationur AC and save money down the line. Getting a professional air conditioner installation is key to getting the most out of your new air conditioning unit. The extent of the installation will greatly depend on the previous system you had in place. If your home has never had central air, it may require new breakers, new wiring, and new ductwork. This is complicated work that needs to be done by a qualified professional. In addition, it’s important to have the system hooked up properly. Otherwise, you will run into problems with efficiency of the system or the system can pull dust in and spew it around your home. Air conditioning systems can last up to 15-20 years if well maintained. It’s worth it to pay for a quality air conditioner installation and get it done right from the beginning. At Cool Comfort Heating & Air, we have over 15 years of experience working for the residents of Davidson. We are confident in our abilities, and our top priority is to leave our customers satisfied with our work. We look forward to doing your air conditioner installation.